Coca-Cola, the soft drinks giant, is launching Coca-Cola Energy, a new energy drink brand for the European market. Featuring “a great Coca-Cola taste and feeling that people already know and love”, the new drink is said to be taurine-free and to feature caffeine from naturally-derived sources, guarana extracts, and B vitamins. Coca-Cola Energy is being launched in Spain, Hungary and the UK before being rolled out in additional countries across 2019 and 2020, mainly in Europe, Coca-Cola said. “Coca-Cola Energy includes ingredients from naturally-derived sources and a delicious and refreshing taste of Coca-Cola”, said Javier Meza, global chief marketing officer of Coca-Cola. “We kept these two qualities at the heart of how we developed the recipe and are proud to offer it under the Coca-Cola brand, inviting people to try a new and different energy drink that is designed to complement upbeat and busy lives”. Jon Woods, general manager, Coca-Cola Great Britain and Ireland added: “Our strategy is to offer people a wide range of drinks to meet different lifestyles and occasions and Coca-Cola Energy is the latest example of that. We’re launching Coca-Cola Energy with and without sugar and we’ll continue to expand and diversify our range of products to offer British consumers a wider choice of drinks”. 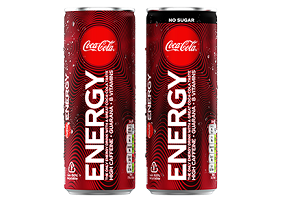 Coca-Cola Energy, which is aimed at young adults (18-35), will be available from the end of April in Regular and No Sugar variants, sold in 250ml cans.